This location cannot be beat! Walk to EVERYTHING from here. This comfortable 2 bedroom, 2 bath condo is located in Sunbow Bay which is only a short 2 block walk to the famous Manatee Beach! Also directly across the street from Publix, CVS, Walgreens, Dunkin Donuts, ice cream, Alvin's Island beach shop, Subway, restaurants and much more. 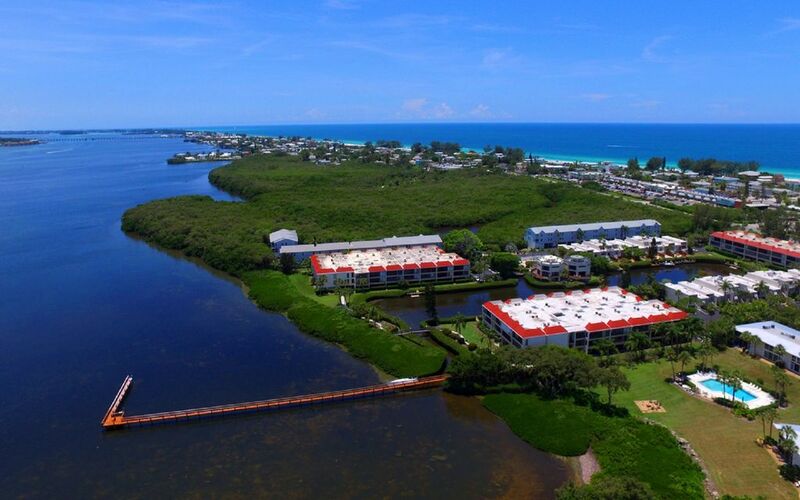 This condo is next to the Island Trolley bus stop which is a complimentary island shuttle with transportation from Bradenton Beach to Anna Maria and all the way in between. Choosing Holmes Beach as your vacation destination is truly the best way to see all that the island has to offer. Sitting on the waters edge, Sunbow Bay has wonderful resort amenities including two heated swimming pools, tennis courts, fishing pier and elevator to condo. Enjoy a view of the bay and lush grounds from the screened in porch complete with dining table. Brand new linens and bedding for all of the sleeping arrangements (KING size bed, 2 TWIN beds, queen Hideabed and a TWIN rollaway). The kitchen is fully stocked and the living room is complete with super comfortable reclining sofa and chairs so that you can really kick your feet back and relax! *See Special Rates for booking Jan plus Feb 2019. Hi we are the Mizener family. Originally from Downers Grove, IL. We arrived in Lake Geneva, WI in 1989 and so we call Lake Geneva our home. Welcome to our new condo on Holmes Beach. Our family has owned property in the area since 1976. Since the 1970s, my mother was always enchanted by Anna Maria Island. Although my parents were snowbirds, she was also considered a local artist for years. She saw the beauty in the area from an artist's eye and spent many days painting on the beach at Bean Point, Beer Can Beach and many local areas. Our new condo was purchased in honor of her and her love of Anna Maria Island. My draw to this particular condo development was the proximity to the Manatee Public beach, shopping and island trolley. Finding a quiet spot near the public beach is easy if you use the side road. It's also an easy exit off the island which can at times get backed up. It's a quiet building and walking to everything is a great benefit. Restful and refreshing stay on an island with beautiful beaches . Thoroughly enjoyed our stay at the condo which was very clean and comfortable just two blocks from the beach. This is a well kept complex with a pool that is heated and very easy to enjoy since it is quiet. Or, sit on the dock overlooking the bay while reading a book. Publix and a number of shops are just across the street which makes it very convenient. It is easy to use the Manatee avenue bridge although avoid the weekends if you leave the island because backups are part of getting on and off the island. Having the trolley transport you around the island is super and do check out the farmer's markets at Coquina beach. Our unit had everything we needed while we explored the island. Check out Holmes Beach for entertainment in the late afternoon and watch the sunset. Enjoyed The Ringling in Sarasota and walked the bird sanctuaries for exercise. If you enjoy seafood there are plenty of restaurants with views of the water and beaches on and off the island. A good place to get away from the cold and snow and just relax since there are multiple beaches and parking is free and plentiful. Thank you. The Condo was very clean, well decorated, close to the beach, and near the shopping center. I can not be happier with the location of the Condo. It was across the street from the grocery store and local shops which is perfect when deciding the daily meals. The condo is well maintained and clean. The property has two heated pools with a temperature of 85 degrees which was perfect for January 2019. The neighbors welcomed us and invited us to the weekly Friday evening gatherings. The beach is only 2-3 short blocks from the property which we visited almost daily. With the free trolley picking you up at the end of the driveway, you have the opportunity to visit the entire island while leaving the car in the covered garage area. We will definitely come back in the future. I'm so happy you enjoyed your trip. It was my pleasure to have you and your wife as my guest. Please come back and stay anytime! Wonderful stay. Very convenient to beach. I really enjoyed our stay. It clean homey and quiet. Very nice get away. I would recommend this to anyone. It is convenient to shopping and beach. It was my pleasure renting to you and hope to hear from you again in the future! Warmest wishes and island dreams!